Azuga - spa, a major tourist centre and point to the chalets in the Bucegi Mountains, located 60 km. north-west of Ploiesti, at an altitude of 950 meters. Azuga is a resort in full development, offering tourists schii part of best quality and an elevator. Breaza - spa situated at an altitude of 450 meters in Prahova Subcarpatii at a distance of 43 km. north-west city of Ploiesti. Busteni - Logs and spa resorts, located at 135 km. of Bucharest, situated at an altitude of 880 meters, at the foot of the Caraiman. The resort is called "the Bucegi Gate", due to its position, opening here are numerous ways to access the mountain, the most remarkable attractions as Piatra Arsa, Jepii Mari, Jepii Mici, Caraiman - monument built in honor of heroes from the first World war and Costila - famous paradise. Busteni resort connects with the Bucegi Plateau through the longest route of cable in the country and has many parts of ski with different degrees of difficulty, both for beginners as well as for the most experienced. Cheia - The key - spa resorts, located at 60 km. north of Ploiesti Municipality, at an altitude of 870 meters, offering visitors came here on holiday, various forms of relaxation and recreation, such as winter sports, mountain outdoors, mountaineering practice, as well as trips to the Massif Ciucas. Paraul Rece - spa, located at a distance of 9 km. of Predeal resort, at an altitude of 960 meters. 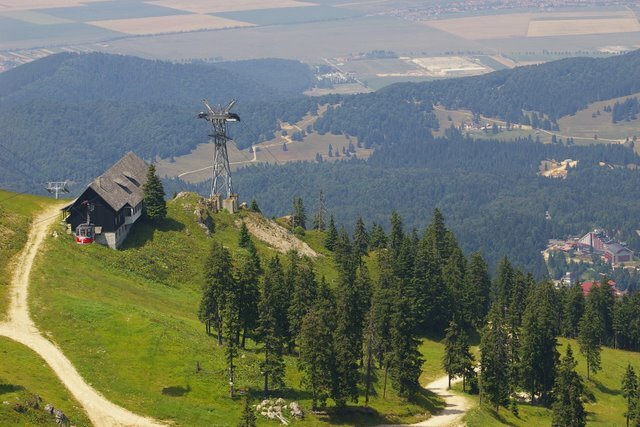 Poiana Brasov - climateric the tourist resort of winter sports, so famous in the country and abroad, located at 12 km. Municipality of Brasov and 190 km from Bucharest, at the foot of the Mountain Postavaru at an altitude of 1030 metrii. The resort has a modern transport network on cable and ski slopes for all ages and all degrees of difficulty. With a well ozonized air, the resort Poiana Brasov is the ideal place for hiking trips and summer, with numerous recreational facilities, chalets and quite beautiful landscapes and places for all tastes. Predeal - very famous resorts, located at 25 km. south of Brasov, at an altitude of 1,100 meters, the town located at the highest elevation in Romania, offering tourists an unforgettable view to Vaile Timis and Prahova, a landscape around, consisting of Mountains Piatra Mare, Bucegi and Postavaru. The Predeal resort is a renowned center for the winter sports, with a network cable transport: lift, lift and ski slopes with different degrees of difficulty. Sinaia - "Pearl of the Carpathians" - as is known, is located at 62 km. of Ploiesti and 45 km. of Brasov, at an altitude of 850 metrii, runs along the mountain slopes Furnica, bordered by massive of Garbova. Sinaia is a rest and treatment but also for holiday and relaxation, offering lovers of winter sports party of different schii degrees of difficulty, the party, grain, ski school, both for children and for beginners and advanced means of transport on cable: chairlift, cable, lift and rental centers of sports ware. Slanic Prahova - climateric permanently resort located at 44 km. of Ploiesti Municipality, at an altitude of 400 meters surrounded by oak forests and orchards. The resort is known for Slanic Salt operation here is one of the largest salt mines from Europe, but also for its water sources cloruro-sodium, which formed in the old saline lakes such as Baia Verde, Baia Rosie, Baia Baciului recognized for the curative effects and spa treatment. Among the objectives of the tourist resort include Salt Union-where there are carved in blocks of salt, busts his Traian, Decebal, Burebista, Mihai Eminescu, or Mihai Viteazul, and Mount of Salt.